This is the heart of the basic front end content solution. GEAR provides user friendly features that handle management of the site navigation and content pages; administered via a password-protected online administration area. 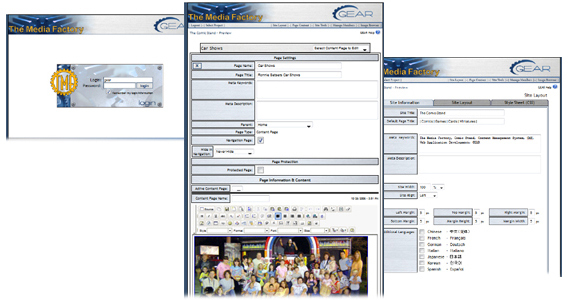 The content management system is very simple to use. A non-technical user can easily administer a fully featured dynamic website. Ability to add, edit, and delete pages and maintain navigation real-time. Page content editor utilities MS Word-like toolbars; enabling non-technical people to update the web site text content and images. Member management that can offer a password protected login to "Member Only" areas of your site. Email management; Set up groups based on your member types to send mass mailings. Enter news, press releases and/or upcoming events. Items are organized/listed automatically by date on the Web site. Most recent entries (say the most recent three) can appear automatically on the home page. The Frequently Asked Question (FAQ) system is available to organize and display frequently asked questions and answers. Questions are grouped by topic, with a topic selection drilling down to questions, and finally the answer to a specific question. This database driven system is searchable and also allows visitors to ask questions not found in the FAQ area. After submitting the question, administrative personnel would be notified via e-mail that a new question has been asked. The admin person would login to a Web administrative area to reply to the e-mail. If desired the question can be added automatically to the FAQ database, with the visitor who asked the question receiving an automated e-mail with their question, the answer, and the place in the FAQ area where their question was added. If additional custom applications are desired, GEAR is designed to allow our Custom Application Development team to create and add custom applications to meet all your needs for a total web based solution.